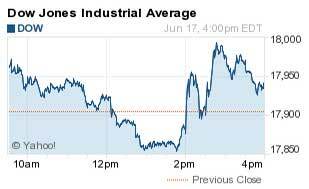 How Did the Dow Jones Industrial Average, S&P 500, Nasdaq Do Today? The DJIA today ticked up 31 points after U.S. Federal Reserve Chairwoman Janet Yellen's statement following the conclusion of the June Federal Open Market Committee meeting on monetary policy. Yellen said the Fed is on track to raise interest rates for the first time in almost 10 years. Yellen suggested that top Fed officials expect the benchmark rate to rise to 0.625% by the end of the year. This would suggest two possible hikes this year, despite news the central bank has slashed its GDP forecast to 1.8% to 2%, down from its previous estimate of 2.3% to 2.7%. The central bank said it expects more economic growth and more job creation in the coming months. One word of caution on Yellen's optimism: Shares of shipping giant FedEx Corp. (NYSE: FDX) fell 3% today on news that the company reported a quarterly net loss. The stock is considered a bellwether of broader economic strength, as strong shipping levels suggest robust activity in both the retail and transportation sectors. Stock Market News: Fed Chair Janet Yellen's statement moved the markets, but investors are still keeping an eye on Greece, which appears more likely to default on its debt to the International Monetary Fund. European stocks fell today as Greece's deadline to pay 1.6 billion euros ($1.8 billion) is now two weeks away. The country and its creditors are no closer to a deal to reform terms and unlock the next round of bailout funds. Oil in Focus: Oil pricesslipped 0.1% after the Energy Information Administration reported that gasoline inventories and crude stockpiles increased at Oklahoma delivery hubs. Shares of Chesapeake Energy Corp. (NYSE: CHK) slipped another 3.5%, hitting a 52-week low. The company was today's biggest decliner on the S&P 500 and has fallen more than 38% since January. Brent oil gained 0.3% to hit $63.87 per barrel. On Tap Tomorrow: On Thursday, the U.S. Labor Department will release the May Consumer Price Index. Economists anticipate that the Index will increase by 0.2%, slightly below April's growth rate of 0.3%. In addition, the markets will keep a keen eye on weekly jobless claims data. Earnings to Watch Tomorrow: Darden Restaurants Inc. (NYSE: DRI), Kroger Co. (NYSE: KR), Liberty Tax Inc. (NYSE: TAX), Red Hat Inc. (NYSE: RHT), Rite Aid Corp. (NYSE: RAD), and Smith & Wesson Holding Corp. (Nasdaq: SWHC). IPO Watch: Fitbit Inc. (NYSE: FIT)stock hits the market tomorrow, June 18, and it is already one of the most anticipated tech IPOs of 2015 so far. With all the hype surrounding the deal, people are wondering, "Should I buy Fitbit stock?" Here's a closer look at the Fitbit IPO in our Fitbit stock primer, which you can read right here. Stocks to Watch No. 1, TRIP: Shares of TripAdvisor Inc. (Nasdaq: TRIP) rebounded from hitting a new 52-week low on Tuesday. The travel deal website saw shares surge more than 14.6% on news it is bolstering its partnership with Marriott International Inc. (NYSE: MAR) and will allow travelers to book hotel rooms with the hotel giant at destinations around the world through its Instant Booking platform. The deal is a boost to TripAdvisor as it provides an opportunity to introduce Marriott's 19 different brands to its customer base. Stocks to Watch No. 2, AGN: The biotech deals continue to flourish. Today, Botox manufacturer Allergan Plc. (NYSE: AGN) announced a $2.1 billion cash-and-stock deal to buy pharmaceutical firm Kythera Biopharmaceuticals Inc. (Nasdaq: KYTH). Shares of Kythera surged more than 22% on the news. This is just the latest deal among pharmaceutical companiesthat are engaged in record M&A Profit Opportunity: How to Profit from the Top Pharmaceutical Companies Now. Stocks to Watch No. 3, TSLA: Shares of electric vehicle maker Tesla Motors Inc. (Nasdaq: TSLA) jumped more than 2.8% and hit a nine-month high on news that the firm has entered into an exclusive partnership with one of the industry's leading battery researchers. The firm is working with Jeff Dahn to reduce battery costs and boost power. Tesla stock is now up more than 34% in the last three months. Stocks to Watch No. 4, CELG: Shares of Celgene Corp. (Nasdaq: CELG) gained nearly 1% on news that its board of directors has conditionally approved an additional $4 billion boost to its pending stock buyback program. The company currently has roughly $5.2 billion remaining from previous buyback authorizations. As companies continue to try to find ways to improve shareholder value, buybacks have been a popular strategy to return cash. But are stock buybacks good for investors? The answer might surprise you.